Russia has decided to ban transgender people from driving cars, because... uhm... well, just because. An expert analyst from a think tank with ties to Putin has stated on Russian TV that the terrorist attack against Charlie Hebdo in France was planned by the CIA. And for all his gay-bashing, isn't there something weird about the photos he keeps posing for? 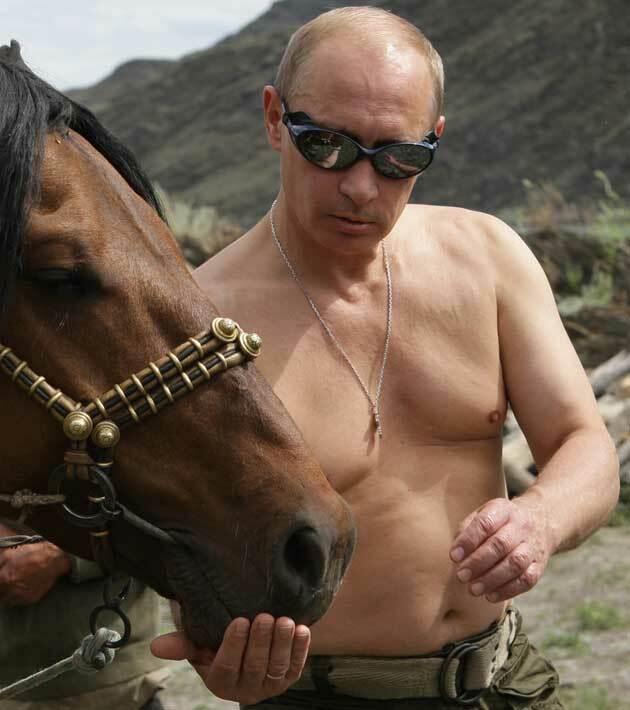 Thought it might be time to revive the old Putin thread. 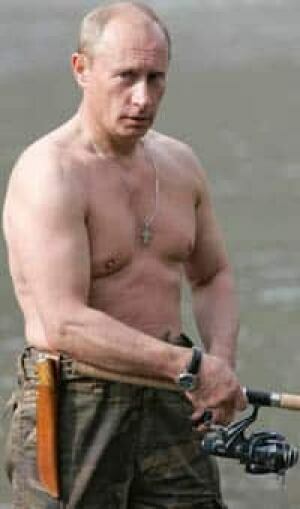 From the Mediterranean to the Pacific, Mr Putin is hailed as an example by nationalists, populists and dictators. “My favourite hero is Putin,” said Rodrigo Duterte, the brutal president of the Philippines. Mr Trump called Mr Putin “a leader far more than our president.” In Italy Beppe Grillo’s Five Star Movement took Mr Putin’s side against the West, and the anti-immigrant Northern League, led by Matteo Salvini, has enthused about his Russia. “No clandestine immigrants, no squeegee merchants and no Roma encampments [in Moscow],” tweeted Mr Salvini during a visit in 2014. “Putin enjoys a cult status with all holding a grudge against the West.” Nowhere is that status greater than with the nationalists of America’s “alt-right”. More like "The so-called “alt-right” is a fictitious entity invented by Putin"
But they still had an impact on the US election. ... well I'll give credit where credit is due. Now talk to me about this renewed Swedish conscription... anything to do with Putin? We're also increasing defence spending and looking into military cooperation with the other Nordic countries. Sweden has called up all of its army volunteers for the first time in more than four decades in a bid to bolster its military strength. The country, which has a reputation for neutrality, last went to war more than two centuries ago. It comes after the Swedish government dispatched brochures to its 4.8 million households on how to prepare for an attack. The pamphlet, entitled If Crisis or War Comes, is meant to get residents ready for a range of scenarios, including military conflict. Sweden, which last went to war in 1814 with Norway, has not sent such instructions to its citizens since the days of the Cold War. That's just the tip of it though. After the fall of the Soviet Union, Sweden cut its military spending drastically, as there were no immediate military threats in the region. The military was also repurposed from mainly national defense to more be a pool for sending troops on UN peace keeping missions. In 2009 the parliament voted overwhelmingly to put the general draft on the shelf. Up till then we had mandatory military service, albeit during the 90's and 00's less than half of the young men eligible actually served, since with all the cuts, the armed forces had a hard time figuring out what to do with all of them. 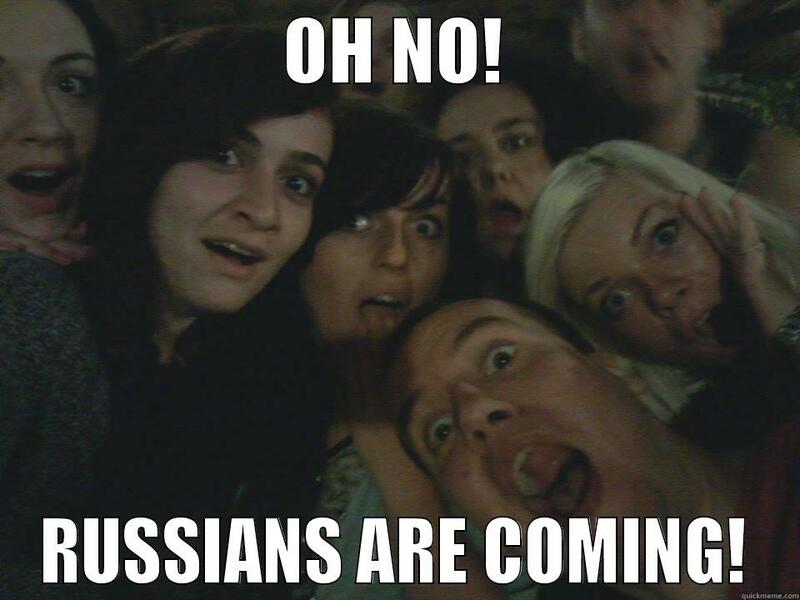 This was a period of time when it seemed Russia wanted to become part of western civilisation. Just one of the guys, hanging out. And make no mistake about it; the Russians are not, as they themselves would like to propose, trying to mediate between conflicting groups in their neighbouring nations. They are invading. Countries seeking to join NATO cannot have any outstanding territorial disputes. Putin considers both NATO and EU threats to Russia and he does his best to weaken them. As both Georgia and the Ukraine had started to lean westward, by launching these mini-invasions, tearing off parcels of land, he effectively prevents them from joining NATO, while also making them less attractive as EU members. Never mind the war crimes. So, this is why all political parties in Sweden now favour increased military spending. This is why the general draft takes effect again in 2018 and this is why we have placed a new regiment on th eisland of Gotland, instead of the one we dismantled about a decade ago. The Russians are no longer to be trusted. Now shooting at, boarding and seizing Ukrainian ships. 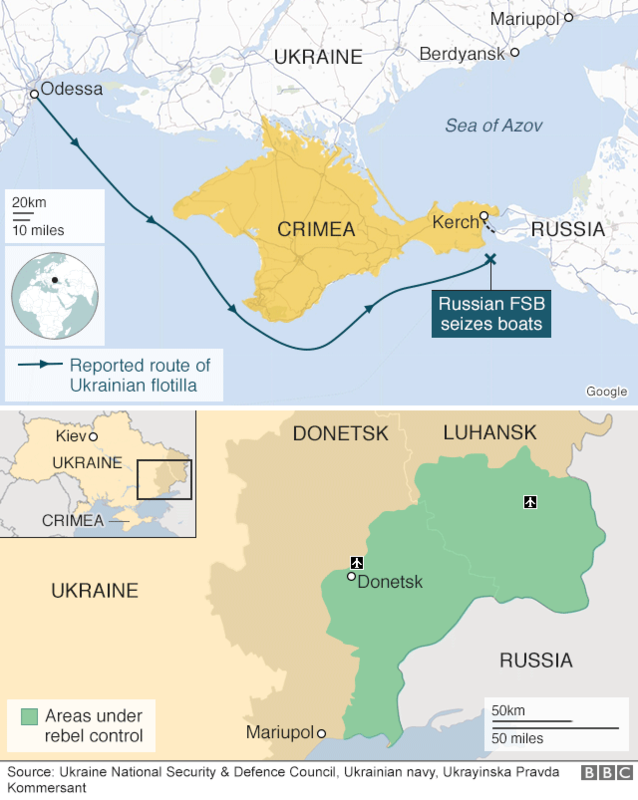 The ships were on route from Odessa to Mariupol (two Ukranian harbour cities) and therefor had to pass through the Kerch sound, which is international water. There is also a treaty from 2003 recognising that both Russian and Ukrainian ships must have free access to the Kerch sound. Of course, that treaty was signed before Russia's invasion and seizure of Crimea, but neither party has revoked it, so it must still be considered valid. Furthermore, eventhough Russia now claims that Crimea is part of Russia, it is only they themselves and a handful of vassal states that recognise this. The rest of the world, including the UN, the US, the EU, Nato, Canada, China, etc, still recognise Crimea as an integral part of the Ukraine, albeit at present under occupation by foreign troops.